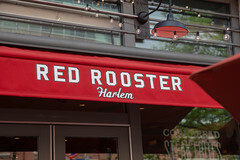 More importantly, Red Rooster has one of the attractions shared by quite a few of the restaurants lining the rather deep sidewalks of Lenox Ave: an extensive sidewalk patio for dining. So, despite some nice music playing for Sunday brunch and a few slightly-ominous crowds, we decided to take a nice, sunny outside table and enjoy a combination of fresh air and people watching. 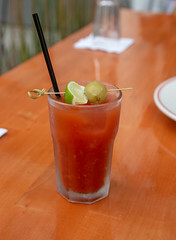 The menu at Red Rooster is, aside from a handful of Asian-inspired fusion dishes, it’s definitely a Southern-centric menu, and for Harlem that works quite well, the place was definitely hopping for a Sunday brunch. 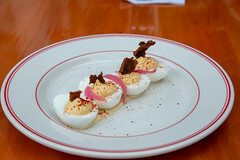 Relatively quickly, we were sitting out at a nice high-top table enjoying our rather spicy Bloody Marys and a plate of deviled eggs. These were a nice riff on the concept, being built with a nice chickpea mayo and some onion jam, topped with a little tasty coupon of duck skin. I’m not generally a fan of boiled eggs, but these definitely were a good twist on the concept: a lighter mayo courtesy of the chickpea, and a bit of sweetness from the onion. 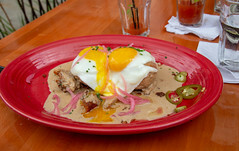 For my main dish, I opted for the Miss B’s Biscuits and Gravy, and this was a bit of a fusion between “biscuits and gravy” and a Benedict: buttermilk biscuit, topped with a fried egg, arugula, chicken gravy, and pulled fried chicken. While probably consisting of a lot of leftovers from the previous night’s fried chicken, like a “smothered chicken”, the pulled chicken just kind of worked: little shreds of tender chicken, a bit of egg, a bit of breading, and a rich gravy, over a well-executed biscuit? The result is a tasty breakfast plate. Carol opted for the “Breakfast pie”, which was a pleasant lamb stew served up with some large, creamy potato chunks and some baked eggs, topped with some greens and some pickled onions, and again this was a pleasant, savory breakfast: a bit of lamb, a bit of egg, a bit of potato, and some greens tying it all together. Overall, we were pleased, and while service was a bit slow due to the rather large number of diners, it was pretty efficient nonetheless, and that turned out to be advantageous: the skies started to open up and pour as we finished our meal, the staff whisking everyone inside. However, we escaped the worst of it, and ended up with a perfectly enjoyable little brunch. I’d love to come back and try the dinner menu.